Sequestration is a group of cuts to federal spending which took effect March 1, 2013. Sequestration was originally passed as part of the Budget Control Act of 2011 (BCA), better known as the debt ceiling compromise. It was intended to serve as incentive for the Joint Select Committee on Deficit Reduction (aka the “Supercommittee”) to come to a deal to cut $1.5 trillion over 10 years. If the committee had done so, and Congress had passed it by Dec. 23, 2011, then the sequester would have been averted. Obviously, that didn’t happen. The Budget Control Act originally stipulated that the sequester cuts would take effect at the beginning of 2013. A deal was reached to avert the cliff, in which the sequester was delayed to March 1. February 28th came and went without any modification bill being negotiated in Congress. The sequester automatic cuts took effect March 1, 2013. President Barack Obama and Members of Congress in both parties want to end the budget caps and the sequester cuts that enforce those caps. President Obama called the caps "mindless austerity" when he released his budget in February. These caps and sequester are a byproduct of the famous 2011 "debt ceiling" negotiations between Obama and House Speaker John Boehner (R-OH). Before those negotiations, the federal government was spending 24.4 percent of gross domestic product (GDP). In 2014, expenditures fell to 20.3 percent. The Budget Control Act of 2011 (BCA), enacted on August 2, 2011, reestablished limits on discretionary spending through fiscal year (FY) 2021. Despite its flaws, the BCA has been one of the most successful lids on federal spending in modern times. Under the existing caps: - The budget deficit fell from the towering heights of more than $1.4 trillion of red ink in 2009 to less than $500 billion in 2014. - The BCA budget cuts made possible the drop in total federal outlays (in nominal dollars) from $3.603 trillion in 2011 to $3.506 trillion through FY 2014. - The caps have restrained discretionary spending. After peaking in 2011 at $1.347 trillion, discretionary spending has been sliced and diced to $1.179 trillion in 2014—a 12.5 percent three-year cut in agency spending, not from the baselines but in nominal dollars spent. Adjusting for inflation, these programs have been cut by 16 percent. If President Obama engineers another end run around the caps with his proposed $74 billion in new spending this year and $362 billion over five years, the discipline of the BCA will be forever lost, and we will be back to the free-for-all of 2009 and 2010. 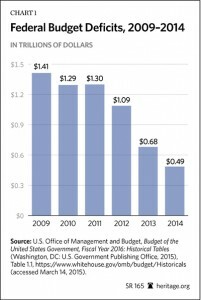 If, instead of accepting Obama's spending binge offer, Republicans can hold to the caps and allow sequester cuts if spending comes in over target, the fiscal picture continues to improve. Despite claims from government officials and commentators that the sequester would wreak havoc on the American economy, the cuts resulted in the loss of just one federal job, writes Nick Gillespie, senior editor at Reason Magazine. When the sequester budget cuts were announced last spring, Washington was overwhelmed with reports that the cuts would be disastrous. Chief among these claims were the jobs that analysts said would be lost. Goldman Sachs predicted 100,000 layoffs, while the Congressional Budget Office estimated job losses of 1,600,000. How many jobs were actually lost? Just one, that of an employee with the Department of Justice's Parole Commission. Senator Tom Coburn (R- Okla.) commented on the divergence between projections and reality: "Despite relentless warnings about the dire consequences of sequestration's budget cuts, it appears sequestration resulted in only one layoff. While that's good news for federal employees and other workers, it is devastating to the credibility of Washington politicians and administration officials who spent months -- and millions of dollars -- engaging in a coordinated multi-agency cabinet-level public relations campaign to scare the American people." Coburn noted that the experts "underestimated sequestration's impact by between 99,999 and 1,599,999 jobs." Of 23 federal agencies, the Government Accountability Office reports that 19 curtailed hiring because of the sequester and seven agencies furloughed more than 770,000 employees for one to seven days. 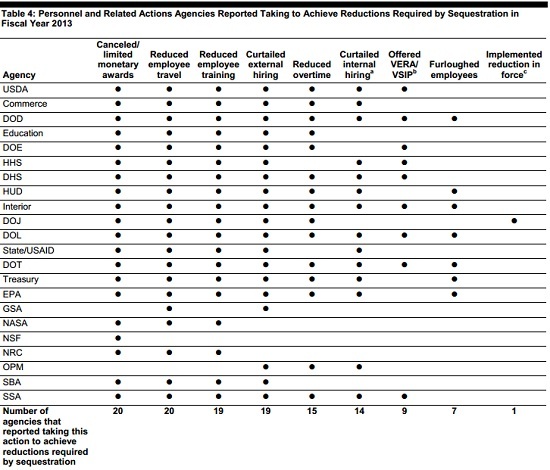 Sixteen agencies reported that they "rescoped" or delayed contracts or grants, 19 reduced employee training and 20 reduced employee travel. The cuts were not as draconian as they were made out to be, Gillespie says. Last year's cuts were set at just $44 billion out of a $3.5 trillion budget. Obama's Not So Grand Offer. White House retreats from doomsday spending cuts predictions. Government Subsidizes Unions through "Official Time"